Bruges is a beautiful old city that still retains many of its old buildings. 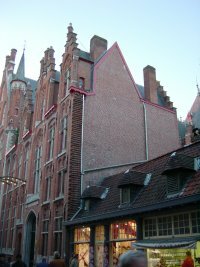 In the Breidelstraat that runs off the square where the Town Hall and the Post Office stand there is an ornate building housing the Ministerie van Tewerkstelling en Arbeid, right behind the Post Office. (Ministerie van Tewerkstelling en Arbeid is the government employment ministry: tewerkstelling = forced labour, in fact, often projects to keep the unemployed from being idle.) The building was clearly meant to extend over the adjacent land, if it was not for the inconvenience of the fact that a small old shop stands there. Thanks to Olaf Perkamp for corrections and extra details.